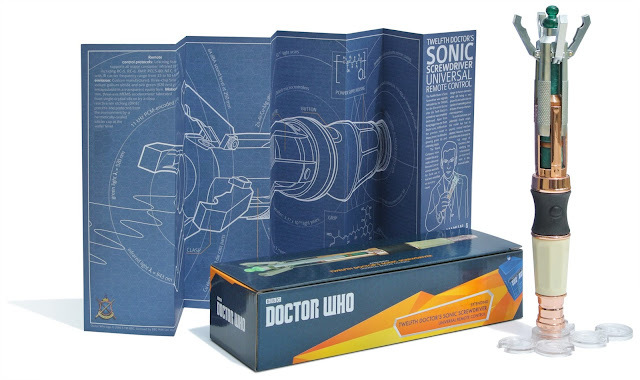 Blogtor Who: The Twelfth Doctor’s Sonic Screwdriver Remote Control Out Now! The Twelfth Doctor’s Sonic Screwdriver Remote Control Out Now! Out today is the fantastic new Twelfth Doctor's Sonic Screwdriver Universal Remote from The Wand Company, check out all the details and images below. Order from www.BBCShop.com HERE. The Twelfth Doctor’s Sonic Screwdriver Remote Control is a brand new, hero prop replica which is a superb recreation of the Sonic Screwdriver used by Peter Capaldi in Series 8. Here's an EXCLUSIVE behind-the-scenes look at the making of the Sonic Screwdriver Universal Remote by Chris Barnardo, inventer & co-founder of The Wand Company. Check it out below! It’s six in the morning on the day after the August bank holiday 2014 and the founders of The Wand Company, Richard Blakesley and I, are driving to Wales to get the reference we need for our next product. A constant stream of emails from über keen Whovians asking for an extending version of our successful Eleventh Doctor’s Sonic Screwdriver, together with the Doctor’s recent regeneration have prompted our special trip to Cardiff – the epicentre of the Whoniverse. It’s a warm day as we pull up in Porth Teigr outside the Roath Lock studios. After the normal formalities, we are led through a maze of corridors with impossibly high ceilings to the heart of the studio. We step carefully round all the boxes and crates that line the passage and with some reverence past the Daleks, powered down and kept under control in a padlocked steel cage. Even the Weeping Angels are thankfully held in check, but I’m careful not to blink as we skirt round them and onto the main set. Shooting is over for another season and the studio is packing up. Recognisable signs of The Doctor’s adventures are dotted throughout the arena-sized hanger. Over in the corner, a knot of people are gathered round a couple of tables photographing and cataloguing a prize collection of iconic props that would set any fan’s pulse racing. The TARDIS Siege Cube, resting casually on the 121 year old edition of The Times that carries that enigmatic personal advert asking the Impossible Girl to lunch, jostles for space with a host of other goodies, but nestled amongst them is our prize – the Twelfth Doctor’s Sonic Screwdriver. In fact there are three of them neatly arranged in protective padding in a small wooden box. This new sonic is a very significant product for us, making this one of our most important trips of the year. 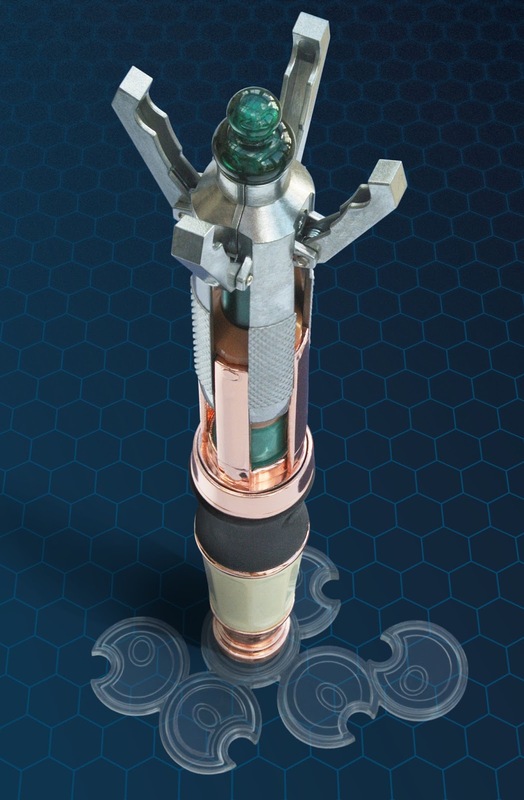 The idea to make an Eleventh Doctor’s Sonic Screwdriver came from our good friends at the Forbidden Planet who as well as suggesting that a Sonic Screwdriver was the ideal prop for our gesture based remote control technology, encouraged us to go to the BBC and get a license to make one. 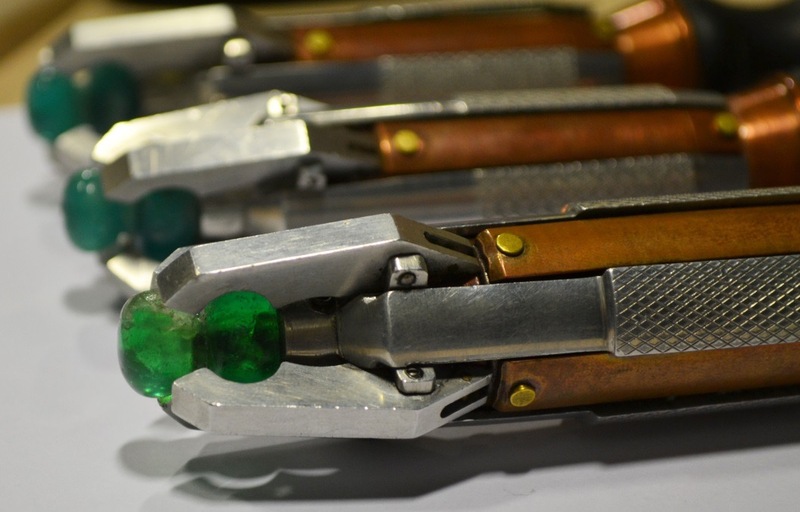 With it we were able to give fans something realistic, something that felt just like the real prop and that worked just like a real Sonic Screwdriver should – controlling stuff at a distance with just an alien flick or a Gallifreyan twist of the wrist. Our Eleventh Doctor’s Sonic Screwdriver exceeded expectations and was an instant classic, but in one respect it disappointed – it didn’t extend. At the time, manufacturing it in metal and then also making it extend reliably and repeatedly, would have made the product too expensive. But we have learnt a lot in the three years since its launch, and spurred on by daily emails from fans begging us to create an extending version, we are now ready to take on this exciting new challenge. 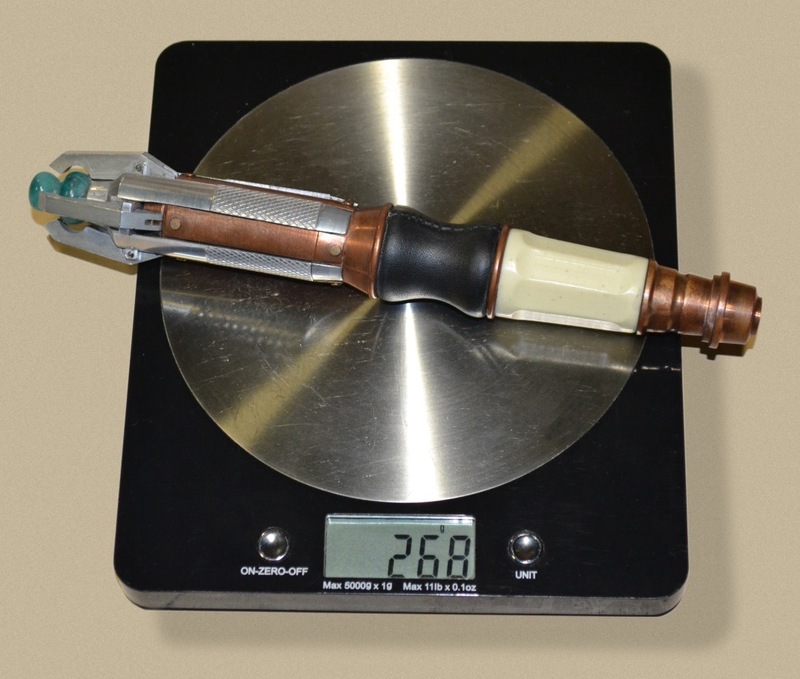 I pick up one of the Sonic Screwdrivers. I can see right away that there are subtle differences between this model and one that the TARDIS (aka Nick Robatto) fabricated for Matt Smith when the previous sonic was destroyed. 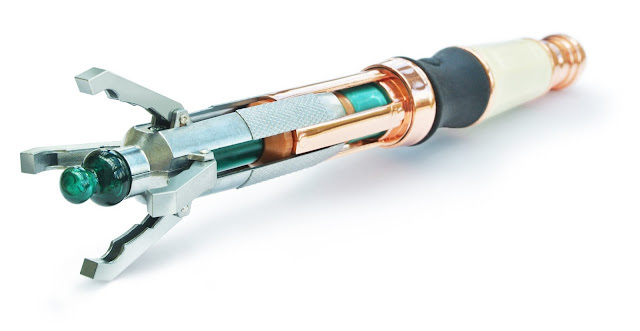 In fact, Doctor Who’s lead prop maker, Nick Robatto is on hand to talk us through the design of the Sonic Screwdriver and how some of its smaller details have gradually evolved to make it easier to make and more reliable on set. Most noticeably, the handle is now an ivory colour with faint inclusions running through it, giving it a natural stone-like look. We get out the Pantone© colour swatches to make sure we get that colour right. The handle’s copper end has changed too. Gone is the lidded button; the new end is only a little different, but up close, it looks more elegant and is slightly tapered. We’ve brought weighing scales and find that the hero prop weighs in at a meaty 268g. We will aim for that, but we know that ours won’t be quite as heavy, as it’s filled with electronic wizardry that is lighter than the metal inside the hero prop. All too quickly the day is over. We say goodbye to Nick and the prop team who have shown us round, and head home full of excitement about our new Twelfth Doctor’s Sonic Screwdriver and how we can make something really exciting for the fans. Before Series 8 was halfway done it had become fairly obvious that the new Doctor would not be getting a new sonic screwdriver, and many fans were disappointed; but not us. 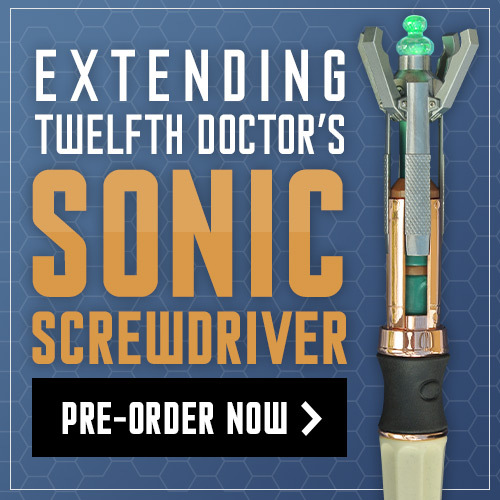 The lack of a new Sonic Screwdriver provided us with a golden opportunity to create an all-new product for fans of the Twelfth Doctor, while effectively re-engineering our Eleventh Doctor’s Sonic to make it extend. Happy Days!